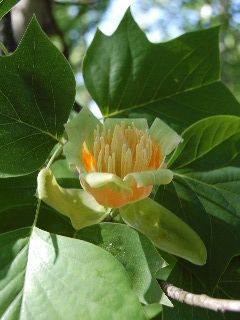 The tulip poplar (Liriodendron tulipifera), or tulip tree as it is most often called, is a fast growing species that is ideally suited for adding to your landscape to create shade quickly. Because of its symmetrical shape and tall columnar single trunk growth habit, the tree makes a perfect stand-alone specimen or, if you have a large open lawn, a number of the trees scattered about the site and spaced with sufficient room to grow to their maximum height and width makes an impressive showing and provides lots of shade to help moderate the temperature about your property. Since the tulip tree can grow so tall (in excess of 100 feet) and so rapidly, do not plant it too close to your house, garage, or other structures. In the course of establishing your landscape design and planning how you will insert your tulip trees into this plan, pay careful attention to the movement of the sun throughout the day and, if possible, throughout the year. If you observe closely and plant wisely, a fast growing tulip poplar that is planted on the southwestern side of your property, approximately 50 to 60 feet away from the house, can start to provide temperature-moderating shade within just a few years. Another factor to consider in the placement of your tulip trees, is that the spread of the branches should not extend directly over any patio or paved driveway areas. The reason for this being that the trees can sometimes be subject to a honeydew like substance from aphids or to a blackish mold-like residue which will drop from the trees and stain the areas beneath the branches. The large 4-lobed lustrous dark green leaves are somewhat square in shape and actually do resemble the outline of a tulip bloom. Also mimicking the tulip shape are the striking green flowers with bands of yellow and orange which appear, usually in abundance, on the tulip poplars in late spring after the trees have already developed their leaves. The seeds produced by these showy blossoms appear to be quite popular with wild birds and squirrels as an appealing food source. In the fall, the dark green leaves turn to a bright yellow, adding a richness to the autumn colors in your landscape. And, although the leaves are large in size, they don’t possess the leathery toughness of some species such as magnolia, thus making the leaves of the tulip tree quite easy to mulch with your lawnmower. 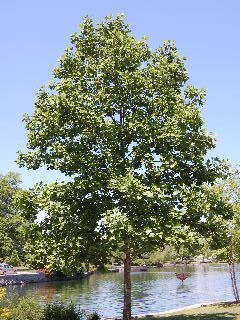 In addition to being a great shade tree for the home landscape, the tulip poplar is an economically important hardwood tree species useful in the production of furniture, plywood, and in general construction. It is a naturally occurring forest species growing in almost all areas of the United States east of the Mississippi River. Another interesting aspect of the tulip poplar, and one related to those plentiful and beautiful flowers the tree produces, is that bees definitely favor this tree in the course of doing what bees do best, and the dark red honey resulting from their efforts around those blossoms is a distinctively flavored product sold with pride by honey producers in many parts of the eastern U.S. Whether standing tall in the forest or in your home landscape, the symmetrical shape and shade-promoting size, the natural beauty, and the utilitarian importance of the tulip poplar tree make it a species that is valuable beyond measure.